While the rest of the team struggles for survival, Diana and Clark are facing their 'rescuer'. The giant being tells them that the Watchtower is fast plummeting to Earth without its power. If it enters Earth's atmosphere the virus on board will infect all life on Earth. The being explains that his people was infected due to their curiosity and they had managed to gather their planet's invading life forms onto his ship but during the meteor shower the watchtower was caught in, he lost power during the ship's self destruct sequence. She discovers that they aren't a virus at all, but it comes too late as she becomes infected too... What else can go wrong? Story - 4: A better told story than the one recently told in Justice League. Given the title I was hoping for something in the vein of survival horror but it is great fun to read just the same. I also don't believe the being's story or motives so I'm hooked. 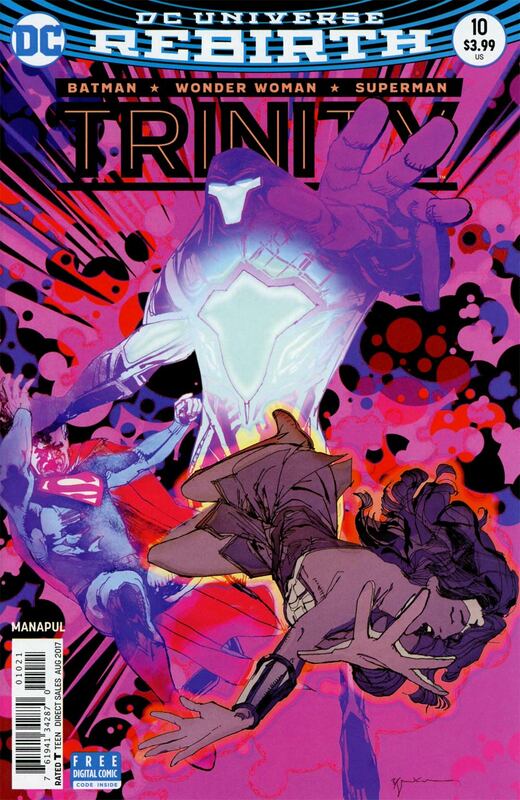 I hope the Trinity gets to shine more moving forward. They have significant roles to play here but I felt Flash, Aquaman & Cyborg hogged the spotlight a little too much and this felt almost like it was in the wrong book. The scene with Superman forcing back the Watchtower is phenomenal, narratively and visually. Art - 5: Having a writer and artist be the same person can often dilute the book somewhat but it most definitely isn't in the visuals. Captivating layouts and literally explosive splash pages. Batman racing around dodging attacks is like a sequence of animation and, as I mentioned before, that scene with Superman trying to stop their base crash landing really took my breath away. Cover Art - 4: This is a nice cover but it's really one that seems destined for a collected edition. 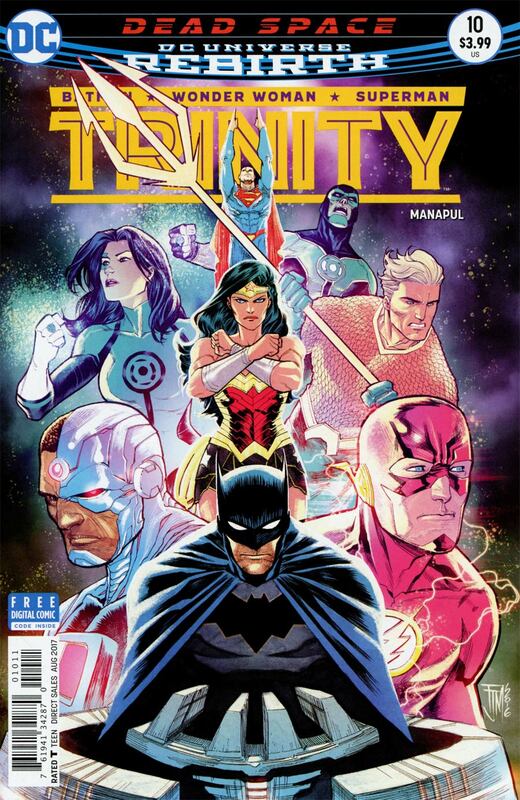 Each character has a focal point but where Manapul could have shone the spotlight on a particular scene inside what we get is an action-less montage. Variant Cover Art - 4: Brilliant art with all the action missing from the main cover. I didn't think I was alone not trusting the Justice League's 'rescuer'.